A recipe for Chicken Parmesan Meatballs was posted recently by one of the food bloggers I follow. I was in love at first site. They looked absolutely delicious and easy to prepare. I needed to bring something to a paddle party and thought these would be perfect, kept warm in a crockpot. With the exception of the ground chicken and the bocconcini balls, I had most of the ingredients on hand. Hey, I am not that organized but I love recipes that don’t require me to completely restock my pantry! The recipe comes together very quickly and you can pair it with almost any starch that suits you. A salad or some sautéed spinach with garlic, and your meal is complete! I hope you make them sometime soon! My paddle friends really enjoyed them, but they were even better the next day, warmed up and served in a crusty roll. Below is the recipe from blog, What’s Gaby Cooking. After the recipe, check out my Kitchen Scout Tips and let me know what you think in the comments! Insert a small bocconcini ball in the center of each meatball, taking care to reform the meatball around the cheese once it’s been inserted. The mozzarella should be completely hidden from sight. Heat the olive oil in a large heavy bottom skillet over medium high heat. Once the oil is hot, add half of the meatballs and sauté for a 3-4 minutes, turning every so often to brown the outside. 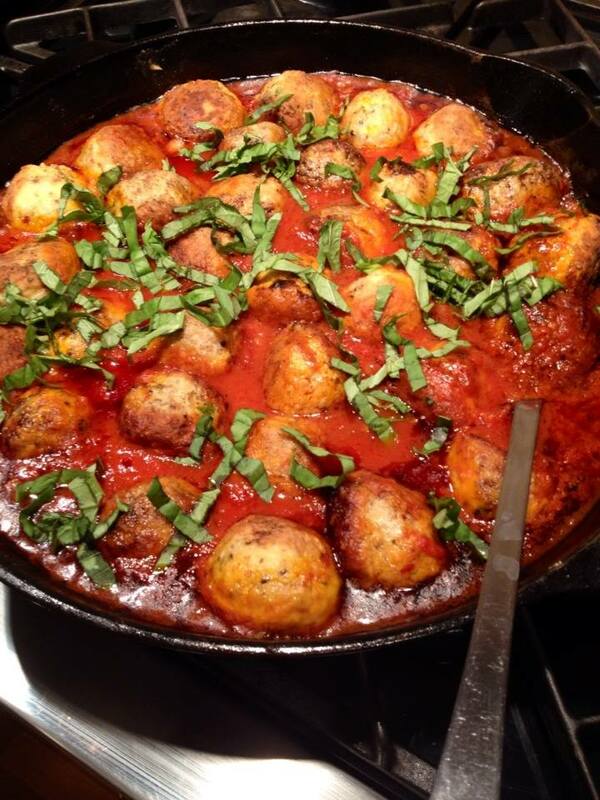 Once the meatballs are browned, remove them from the oil and repeat the process with the remaining meatballs. Transfer the skillet, meatballs and all, into the oven and let the meatballs continue to bake for 10-15 minutes until cooked through. Remove the skillet from the oven and dusting with salt, pepper, freshly chopped basil and extra bocconcini if desired. Serve immediately. So, here are my tips not included in the recipe. First, the recipe will make 16 meatballs (1pound chicken, 1 ounce each). Best to use "ground chicken" which means it is not all white-meat as the dark meat will have more flavor (or at least a combination). Also, chill the meatballs after you've formed them as they will hold their shape better when sauteeing. As I was making this, I thought it would actually make a good meatloaf! Double the recipe, use the the meat mixture as bottom and top layer with a layer of mozzarella in between. Top with some of the marinara and cook at 350 for 30 minutes. Enjoy my friends!